El Lissitzky was a Russian designer whose ideas inspired and innovated typography and graphic identity in the twentieth century. Influenced by post world war one Russia, and movements such as constructivism, suprematism, Bauhaus, dada and in reaction to communism and poverty, Lissitzky upheld a new approach at understanding design, type and image that represented much meaning in its context to communicate messages that even the illiterate could understand. The function of pictorial representation was a large component of Lissitzky’s work, he closely based his ideas on the constructivist ideology. Constructivism was held together by three principles; tectonics- which, “represented the unification of communist ideology,” texture- which, “meant the nature of materials and how they are used in industrial production,” and the principle of construction- symbolizing “the creative process and the search for laws of visual organization.” (Meggs 289) Lissitzky actually did not refer to himself as an artist, designer or typographer, but as a constructor, as if he were an information architect. In his 1923 design of the book,“For the voice,” we can see these elements as they function to narrate each of Mayakovsky’s poems. 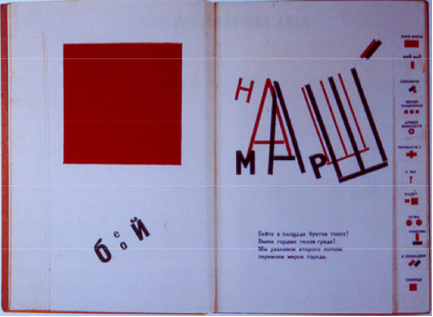 In the construction of the pages, based on the notion that each poem is to be read aloud, Lissitzky represents a narrative with the forms, color, typography, layering and rhythm which is inherent in not only the positive, but the negative space as well. On this selected page, “the poem ‘Our March’ begins, ‘Beat your drums on the squares of the riots, turned red with the blood of revolution.’” He represents the essence of a beating drum in the layered form of the right-most “w” shape, where the staccato seems to appear like a drum mallet in motion. The blatant red square on the left is representative of the blood-stained squares of the riots, like Moscow’s historic Red-Square. Lissitzky designed his pages with “an understanding of such printing possibilities as overlapping color, [which was] important in his work.” (Meggs 291) The spatial composition and the contrast of color was evident in “For the voice” as he interprets issues of the revolution. The diagonal and offset lines were meant to negate a parallel line, which would represent order. The historical context of the book took place in times of conflict and he wanted to resemble a change which would lead to a new international art that had no ties to a particular culture. Some other significant work of his was “The Isms of Art” in 1924, which used bold rules, sans-serif typography, tri-column grid structure and interpreted the work into three languages. This text was very indicative of the modern era in its asymmetrical balance, use of type, thick lines and consideration of white space, especially on the pages of reference images. Another revolutionary work of his is a 1929, “poster for a Russian exhibition in Switzerland.” (Meggs 294) The poster conveys a positive equality of gender in the Soviet Union, as the lettering of USSR is stretched across the figures of a male and female, appearing the same size, smiling and looking off into the distance.